Sitting with my Research Thesis , while sipping a coffee accompanied by the cold weather, all that I can do is to smile a while because it feels great to know that someone has come to my blog and taken a look around. You know that feeling…I started my blog on October 2011 and I never knew, I could keep it running to this day. Getting readers, who experience and appreciate me for what I write, is truly a blessing. When they accept my writing, they are accepting me as a person, they are considering me as what I am and welcoming me as the girl, next door to their life. When I hear it from you that had experienced it and you could relate it to your life, I feel I am somewhere at Home. It is already rewarding for me to get this much page views, comment and likes of my fellow Facebook readers. And now, for the first time when I have been nominated for Leibster Blog Award by Anupam Patra of Reflections. As a blogger, this is one of the best gifts,, one could receive. It is all the more precious to receive it from a talented writer like him. His, is one of those blogs, that inspires me a lot and it is a kind of exploration for me. I met him from Indiblogger and it is from there, I am realizing the power of networking. I remember it reading somewhere that, in a journey to become a great writer , relationships are what you all need. Making friends, finding readers and earning patrons is nothing lesser than a challenge. This is very important in growing the platform and getting the words, heard. Non-writers think we write because we’re sad. Because we have issues. But we write to save ten-second lifetimes which would otherwise have gone unremembered. We write to capture the beauty of a moment or a sound or a face...I am so happy for my Leibster Award.. The word Liebster is German and means sweetest, kindest, nicest, dearest, beloved, lovely, kind, pleasant, valued, cute, endearing, and welcome. Isnt it pretty interesting? I love it totally. 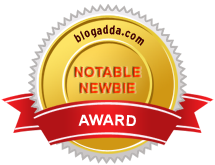 This is an award for the bloggers to support other upcoming bloggers (with less than 200 followers). Leibster. The Liebster Award is for bloggers with less than 200 followers. Award winners share 11 facts about themselves, answer the 11 questions asked by the blogger who tagged them, come up with 11 of their own questions and tag 11 more bloggers with the award. To all those who asks me, Why this madness, I always reply that, it is my madness that keeps up my sanity. I wish to live my everyday differently. And yes, I do. 1] 'Checkered blue n white' or 'black'? 2] Curtains or no curtains? 3] Hardcover, paperback or ebooks? 4] What's your ambiance while writing? 5] Do you plan to publish a novel? 6] Do you like to make a gift for your loved one or do you rather buy? 7] Which is the most beautiful color according to you? 8] What’s your mantra in life? 9] Have you ever thought of becoming a soldier in your life? 10] Do you have stage fear? 11] ‘Mickey mouse/ Aladin/Duck Tales’ or ‘ Shin Chan/ Doraemon/ Kitretsu’? Yet to grow up or Grown up? Forbidden fruit- is tasty or bitter? Person who most influenced the way you are? First thing that attracts you to others? Ever been ditched by a guy or girl? If you are writing a book about yourself, what would you like the last lines to be? Interesting post Ashitha. Enjoyed reading it. Congrats for the award! Congratulations Ashitha. Hope your find love in all means possible. hearty congrats ashitha :-)..and thanks for the tag! you got a great future..my wishes and support are with you always..keep going! And thanks for tagging me! That would certainly help me overcome the writer's block am facing lately! !